June 2012 – Well, Here's Another Nice Mess . . . 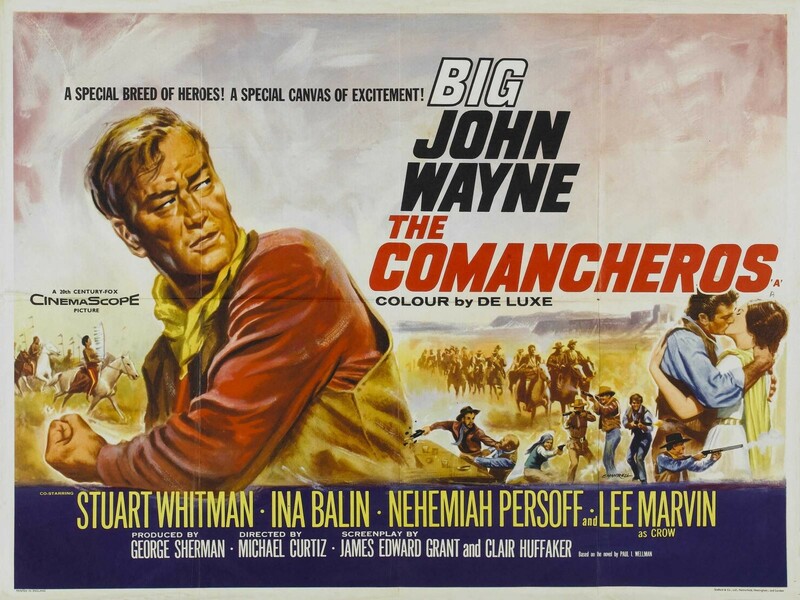 The Comancheros (1961) is not a great film, it is not even a top John Wayne western; but it is the last signed film of Michael Curtiz, who began his directing career in 1912 in the old Austro-Hungarian Empire and worked steadily for almost fifty years through to this film. Curtiz was dying of cancer when he began shooting The Comancheros. Because he was too ill or was working too slowly, or a combination of the two, John Wayne took over at some point and finished directing the film, without taking credit. At least, that is how the story goes. The film opened in October 1961 and Curtiz died in April of 1962. Okay, so why write about The Comancheros? Well, initially it was so I could post some screen captures from the terrific looking Blu-Ray disc from 20th Century Fox and write about what a pleasure it was to view. The cinematography by William Clothier is quite spectacular. Unfortunately I don’t have the software do accomplish that, so any images I post for this are just what I could of the internet. Like the image of the poster to the left. I would like to have that poster. But anyhoo. Second, I like old fashioned Westerns. This one could have been a whole lot better; but still is kind of fun. 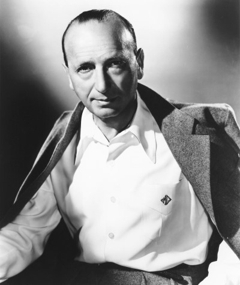 And third, Michael Curtiz directed so many films that I like, love and enjoy, that I thought would a couple words about him–not a tribute as such but just a short thank you. The Comancheros takes place in 1840’s Texas. I read that it is supposed to be 1843 in the film, but one character I am certain says that her husband had died four years before at the Battle of San Jacinto, which was in 1836 making the film time 1840. It is of no matter. Historical accuracy is not one of The Comancheros strong suits. The characters talk of places that did not yet exist, use weapons that were 25 years in the future and so on. Taking place in Texas it was mostly shot in Utah, with the rest in Arizona. Best to let all of those kind of details slide. Anyway, the story involves Texas Rangers, Comanches, Gun-runners, the titled Comancheros, an outlaw society that lives with-in their own ruled society and some awkwardly shoehorned romance. It has two (count’em) two saved by the Calvary Rangers climaxes. The script attributed to Wayne drinking buddy and in-house writer James Edward Grant and Western novelist & screenwriter Clair Huffaker is a rather lumpy affair that lurches from scene to scene more than moves organically. This is possibly due to the fact that the John Wayne character, Jake Cutter in the Paul Wellman novel, on which the film is based, is not the main protagonist. That would be Paul Regret, played by second billed Stuart Whitman, the footloose gambler who finds love and a sense of responsibility, has something of a character arc. Captain Jake is pretty much the same at the end as he was at the beginning. But that’s okay it’s John Wayne. The plot. Gambler Paul Regret (Stuart Whitman) has to flee Louisiana after killing the son of a judge in a duel. He meets and briefly romances a dark haired beauty (Ina Balin), who promptly disappears. He is just as promptly arrested by Texas Ranger Jake Cutter, who likes to call Regret “Monsewer”, and tells him “and I ain’t your friend.” Jake is the tough incorruptible kind who is gonna take Regret in no matter what. That’s the basic setup. There follows various colorful scenes with tame Indians; marauding Indians; Texas Rangers; settlers, beautiful and otherwise; gun-runners and eventually the Comancheros. During this, Regret escapes, is caught again, learns about the ways of the west, saves the day, becomes a Texas Ranger and of course comes face to face with the dark haired beauty, who just happens to be the daughter of the leader of the infamous Comancheros. There is entirely too much speechifying in this movie (courtesy, I’m sure of James Edward Grant) about nation building and the like instead of just telling the story. It’s a pretty good story, there is just too much stopping to talk to pontificate. While there are a couple of nice character bits in The Comancheros (Edgar Buchanan, as a corrupt judge; Guinn “Big Boy” Williams, in his last film performance, as a not so bright gun-runner), there is a particular shot of hot adrenaline that I need to make note of–Lee Marvin. Somewhere about mid-point, a loose cannon gun-runner named Tully Crow bursts into John Wayne’s (who’s undercover–you can tell by the hat) hotel room. For the next few short scenes Crow/Lee dominates; hollerin’, stompin’, drinkin’, boastin’ and threatenin’, all in the way only Lee Marvin could do. This despite a rather unbecoming piece of rubbery makeup, that sort of looks like one of those fake vomit gags, that’s supposed to represent a partial scalping by the Comanches. Marvin adds a lot of much needed energy. Then, of course, the Duke blows him away. Too bad. 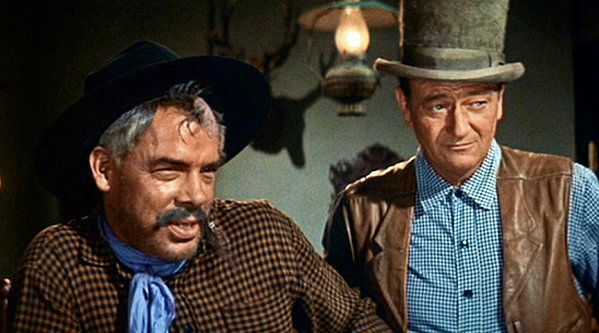 If the head bad guys, played by Nehemiah Persoff and Michael Anasara had half as much intensity–fine actors though they are–The Comancheros could have been a whole lot more fun. Favorite Jack Elam does pop up late in the movie as a Comanchero for a couple of brief bits, but doesn’t get to add much of his Jack Elamness. Again too bad. I don’t want to pick too many nits, The Comancheros is a fun Sunday afternoon Western (or Sunday night–whatever) it just had the elements to be so much better. Wayne, relaxed and quite drolly funny, is very good. Stuart Whitman (who I think should have been a bigger star) is very likable and generally plays well with Wayne, even if their relationship is never really well developed. Just when you think it is going to get good, it doesn’t really, or not enough. There are only really two action scenes: an Indian attack on a ranch in the early middle part and the escape from the Comanchero settlement and not much in between. I guess this is one of those films that I really want to like, but think: “Man, if only . . .” I have any number of those films.–this is just one. I said that the script was a problem. I would like to see what Clair Huffaker’s script looked like before Grant got his mitts on it. It was probably tighter, with a better through line. But I will never know. (The Comancheros does have some plot similarities to Rio Conchos, a film Huffaker scripted a few years later. It is a real ripsnoter, with a great performance by Richard Boone and incidentally co-starred Stuart Whitman.) Maybe, also if it had a better overall directorial grip; which brings me back to Michael Curtiz. I said earlier that Curtiz was ill and essentially dying from cancer when he began The Comancheros. Consequently, I really don’t know how much to credit him for, since John Wayne, from most accounts, pretty much took over at some point. Anyway, Curtiz is responsible for a lot of great or at the least very good films during his half-century directing career. To my mind, he had not made a great film since 1950’s The Breaking Point, the best adaptation of Hemingway’s To Have and Have Not, with John Garfield. The widescreen and color were not his elements. Maybe I need to look at more late Curtiz. He did do some late films I like: We’re No Angels; King Creole, the ever popular White Christmas and I should take a real look at The Egyptian; but I think old academy ratio and silky black & white were his meat. Captain Blood, Angels With Dirty Faces, The Adventures of Robin Hood, The Sea Hawk, Yankee Doodle Dandy, Mildred Pierce and his classic to end all Hollywood Classics: Casablanca. Yes, Robin Hood was in color and other good films he did were in color, but you get my drift–he was a classical period guy. He made films in pretty much every genre; and he made them well. Irascible old Mike Curtiz, it was said that he could speak five languages, all badly. The title of David Niven’s autobiography “Bring On the Empty Horses” is supposed to have been from something old Mike commanded during the filming of The Charge of the Light Brigade. So here’s to you Michael Curtiz, The Comancheros wasn’t the greatest–“but, we’ll always have Paris.” C’est la vie.